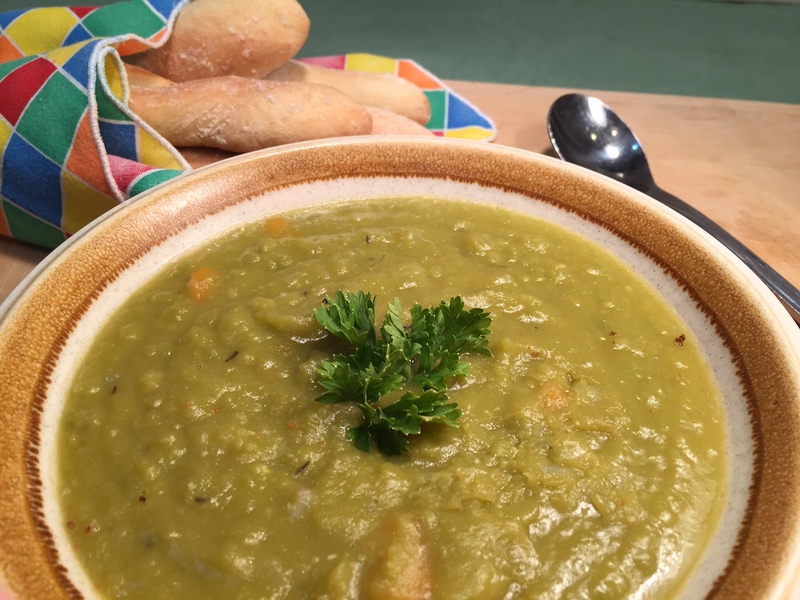 SPLIT PEA SOUP – Perfect For Chilly Nights! It’s Fall. Days are getting shorter; nights are getting colder. Suddenly, a steamy bowl of soup sounds like the perfect meal. Not only does soup make you feel warm and toasty, it fills you up without a lot of calories. This is important as we approach the holidays – also known as Weight Gain Road. One of my favorite hearty soups is Split Pea. It’s fast and easy to make IF you plan ahead. If you don’t, then it’s just easy. This is because split peas take a long time to soften, which means hours of simmering. You can drastically speed up the process by soaking the peas overnight, thereby whittling cooking time down to half an hour (seriously!). So before you go to bed, put the dried split peas in a large bowl and pour the allotted water over them. I boil the water first to give a boost to the softening process, but I’m not sure it really matters. Soak peas overnight (or, early in the morning) in the water and 1/2 tsp of the salt. To cook, pour the peas and soaking water into a pot and bring to boiling. As this is heating up, prepare the vegetables. Add them to the pot. When soup is boiling, reduce to simmer, cover, and cook for about 1/2 an hour. Taste test to see if peas are softened. Add in cayenne, thyme, and remaining salt. Adjust seasoning, as desired. Ladle 2 cups of the soup into a blender and purée. Pour back into the pot. If the consistency is too thin for you, simmer the soup UNCOVERED another 15 minutes or so, stirring now and then. NOTE: If you didn’t soak the peas, put the dried peas and water into a pot, bring to boiling, reduce to simmer, cover, and cook for about 2 hours. Then proceed with instructions above. On a recent trip to Los Angeles, I was perusing a dinner menu the size of a short novel. As I skimmed through the titles and descriptions of various items, I noticed ‘sorghum’ was repeatedly listed. Sorghum? Not only was sorghum listed as an ingredient in wraps, salads, and soups, it was also made into breads. We whispered between us (embarrassed by our ignorance) as to what this ingredient might be. A vegetable? A cheese? Some kind of soy product? 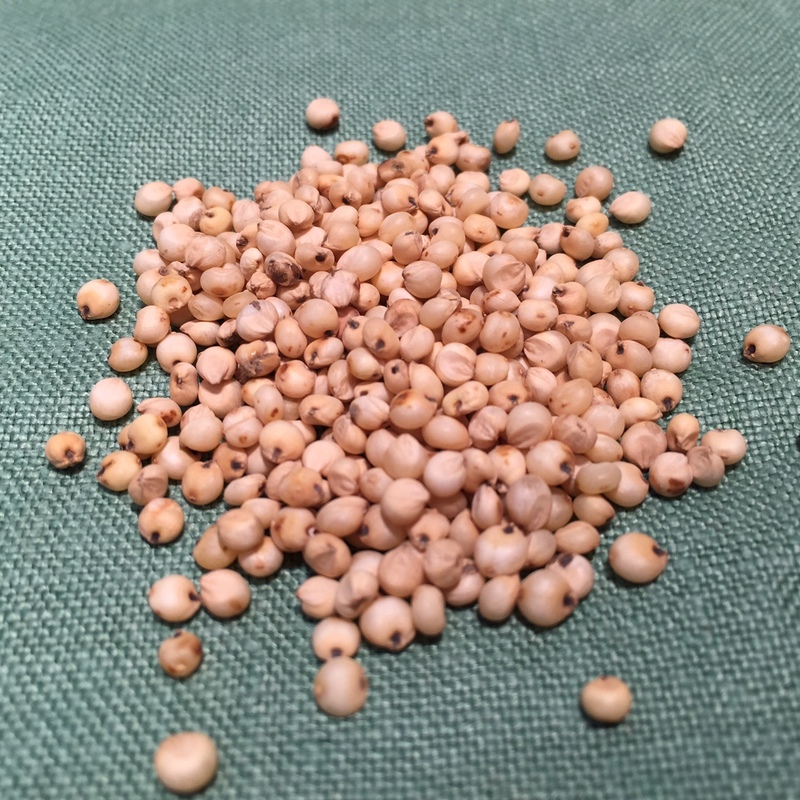 It turns out sorghum is an ancient grain, popular in Africa. It can be used like rice, but requires far less water to grow – an important fact in drought ridden California. It’s round, like barley, and has a pleasing chew to it. Also, for those concerned with gluten, it’s gluten-free. Being a gal who treads on the cutting edge (or, at least, nearby), I decided to prepare a sorghum dish and see for myself what LA folks already know. It took 3 tries to find a store in my area that carried this grain – even Whole Foods was a bust. I ended up locating it at a local natural food store, purchasing their one and only bag. I found a curried sorghum and carrot salad recipe, then promptly adjusted it to suit myself (because that’s what we cooks do). Very tasty! NOTE: I prefer to use powdered coconut milk so I can make exactly what I need.That way I don’t have to find a way to use up the leftover milk from the canned coconut milk. I order it online. Bring sorghum, 1/2 tsp salt, and water to a boil. Turn burner down, keeping water at a simmer. Cover with lid slightly askew to allow steam to escape until most of the water has been absorbed – then you can put the lid completely on. Start taste testing after about 50 minutes. Once the sorghum is chewy, but not crunchy, it’s done. It can take as much as an hour or more to cook. Pour through a sieve to remove excess water. While sorghum is cooking, prepare the dressing. Combine the coconut milk, vinegar, curry, chili, 1/2 tsp salt, and sugar. 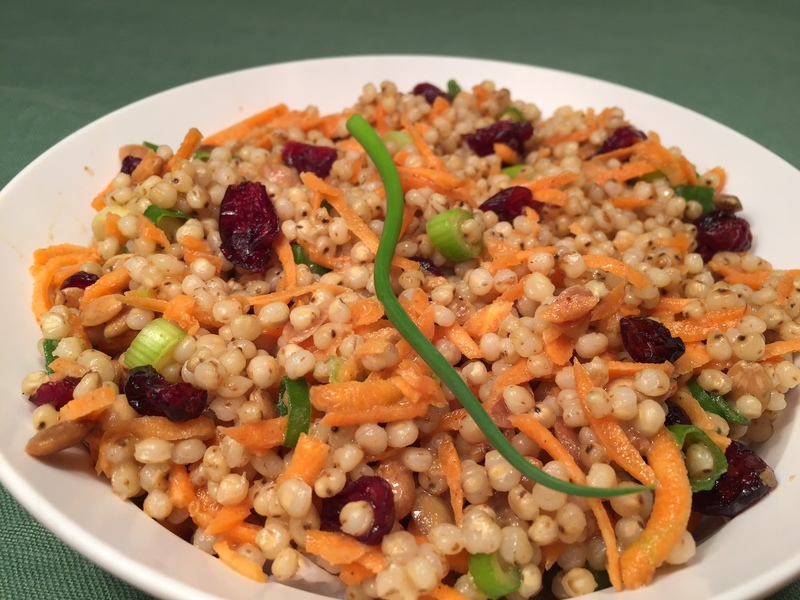 Blend together the cooked sorghum, dressing, carrots, cranberries, scallions, and pumpkin seeds. Refrigerate. Can be served room temperature, but I think it’s best chilled. 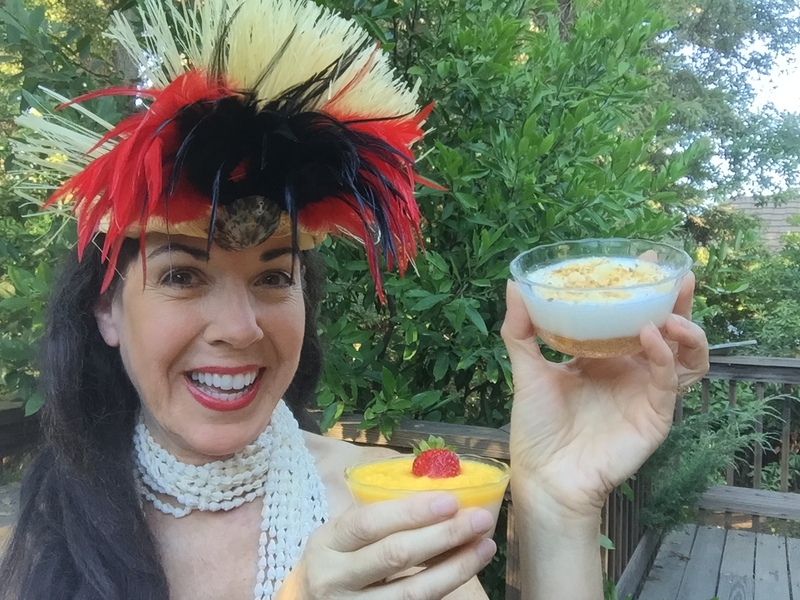 HAUPIA & MACADAMIA SHORTBREAD CUPS – Aloha!!! Hello. My name is Bonnie and I’m a chocoholic. It was destined to happen – my mother consumed some form of this delectable treat everyday of her pregnancy with me. My fate was being written with each chocolate doughnut she vowed she wouldn’t eat…but did. 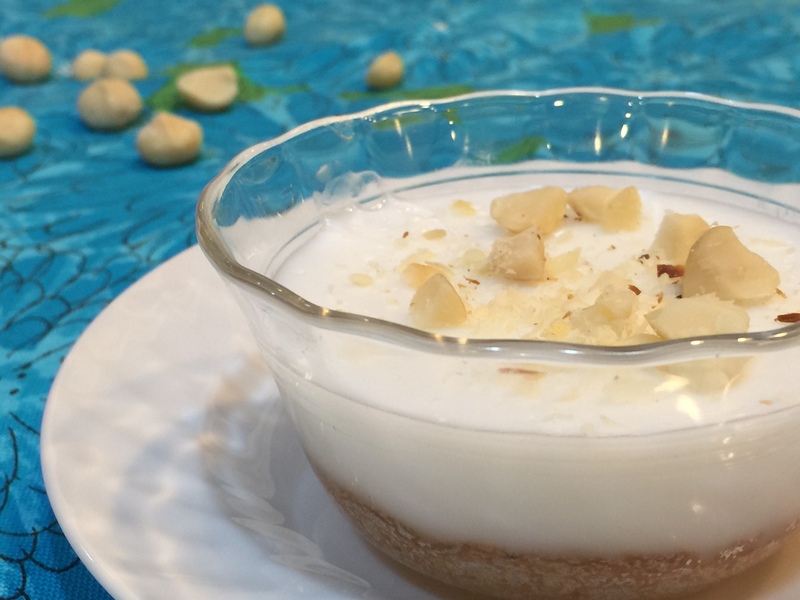 I decided to make haupia – a coconut jello-like pudding, in memory of my Tahitian dancing days. As with most ethnic groups, food plays a central role in the Polynesian world. The first potluck I attended, I was asked to bring haupia. Not realizing there was such a thing as canned coconut milk, I actually bought coconuts, cracked them open, removed the meat, and made my own coconut milk. It took hours of life threatening work with a hammer and a sharp knife. The haupia was delicious, but definitely not worth the effort. Years later, I saw canned coconut milk in the market. It was a slap-palm-to-forehead moment. In keeping with my portion control doctrine (everyone over 40 knows why), I made the haupia in custard cups. One cup = one portion. No nibbling those odd pieces in the pan that “no one else will eat and it’s sinful to waste.” Just to add a little substance, I poured the haupia over macadamia nut shortbread. And, then, because I can never let things alone, I made a mango sauce topping. The mango sauce was delicious and extremely pretty, but I confess I prefer HAUPIA & MACADAMIA SHORTBREAD CUPS sprinkled with just some toasted chopped macadamia nuts. Without the scene-stealing mango, the flavor of the toasted macadamia nuts bursts forth, complementing the subtle coconut flavor. 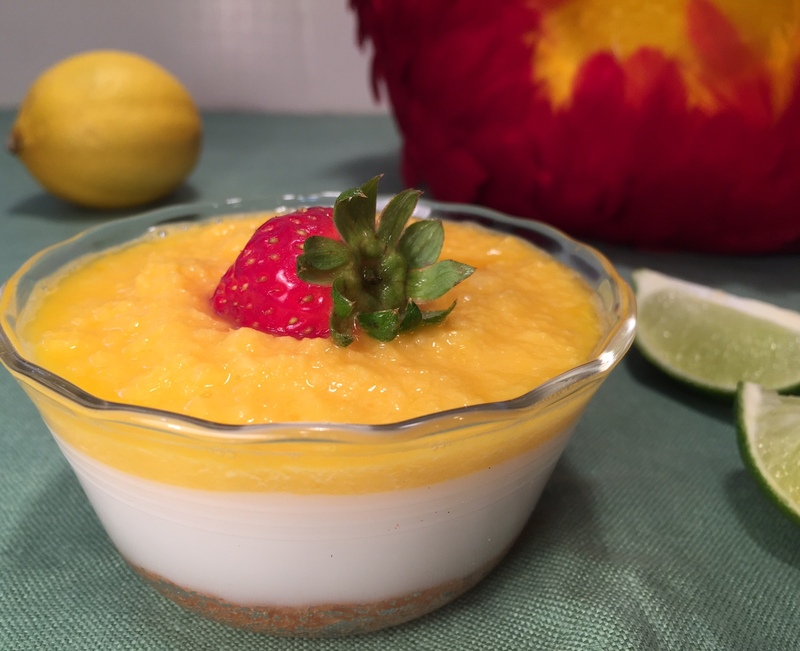 Topped simply with chopped toasted macadamia nuts or perked up with Mango Sauce, HAUPIA & MACADAMIA SHORTBREAD CUPS are an easy, light dessert. NOTE: It’s important to toast the macadamia nuts – I put the word “toasted” continuously in front of the word “macadamia” to remind you (I’m a mom – it’s what we do!). Toasting brings out the flavor and gives a better crunch. Just make sure you keep an eye on them – they go from lightly browned to black in an instant. ADDITIONAL NOTE: I now use powdered coconut milk – that way I can use exactly what I need instead of opening a whole can for a small amount. Put toasted macadamia nuts, salt, and sugar in a food processor. Whirl until nuts are tiny bits. Add in flour, vanilla, and butter. Blend until batter is creamed. Pat dough into into the bottom of 4 ungreased custard cups (or muffin tins). It comes out to about 1 tablespoon of dough per cup. Bake for approximately 15 minutes, until tops are golden brown. Remove from oven and cool in cups on a wire rack. Put the cornstarch, sugar, and salt in a small saucepan and mix. Pour in some of the coconut milk and make a smooth paste. Add in the rest of the milk and heat over a medium flame, stirring constantly. Continue to stir until the liquid is thickened – about 5 minutes total. Pour evenly onto the shortbread in custard cups. Let cool, then refrigerate at least 5 hours to set. Purée all ingredients together in a blender or food processor. Serve on top of haupia, if desired. NOTE: If you’re using a muffin tin instead of custard cups, add the Mango Sauce after plating. To remove the HAUPIA & MACADAMIA SHORTBREAD CUPS from the tin, carefully run a dull knife around the edge, working your way to the very bottom to release the shortbread. Carefully, lift out and transfer to plate. Last week I posted about Breakfast Burritos and it occurred to me I should post about making homemade flour tortillas. You may be wondering why I bother making tortillas. Of course, there are the usual reasons: it’s cheaper (although it’s pretty cheap to buy them), and I have control over what goes in them. But, the main reason I make them is because the purchased packages contain at least 8 tortillas – which is way more than I generally need. Yes, I realize I’m the Queen of Freeze, but, unfortunately, tortillas don’t freeze well. Since I hate waste, I would find myself snacking on them just so I didn’t throw them out. Those are empty calories I DON’T need! 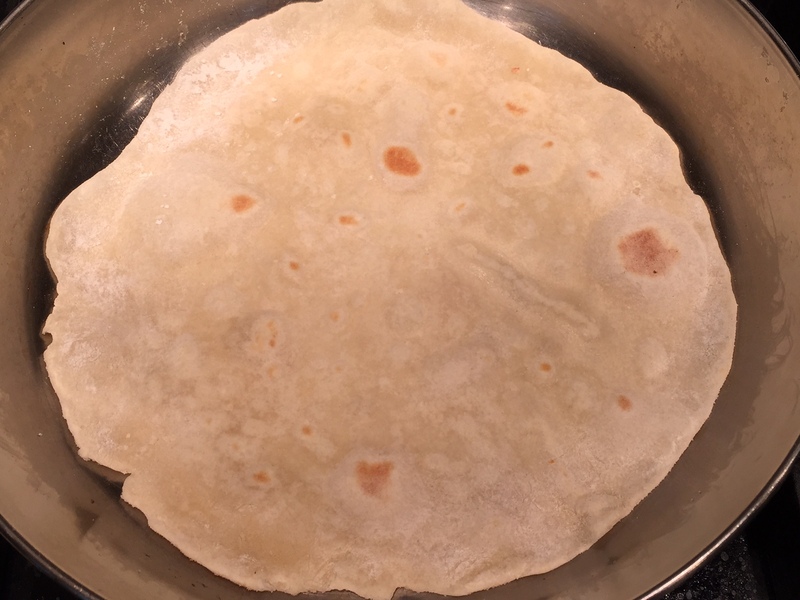 Flour tortillas are surprisingly easy to make, once you get the hang of it. Just roll them out on a floured board and quickly cook on a dry, heated skillet. 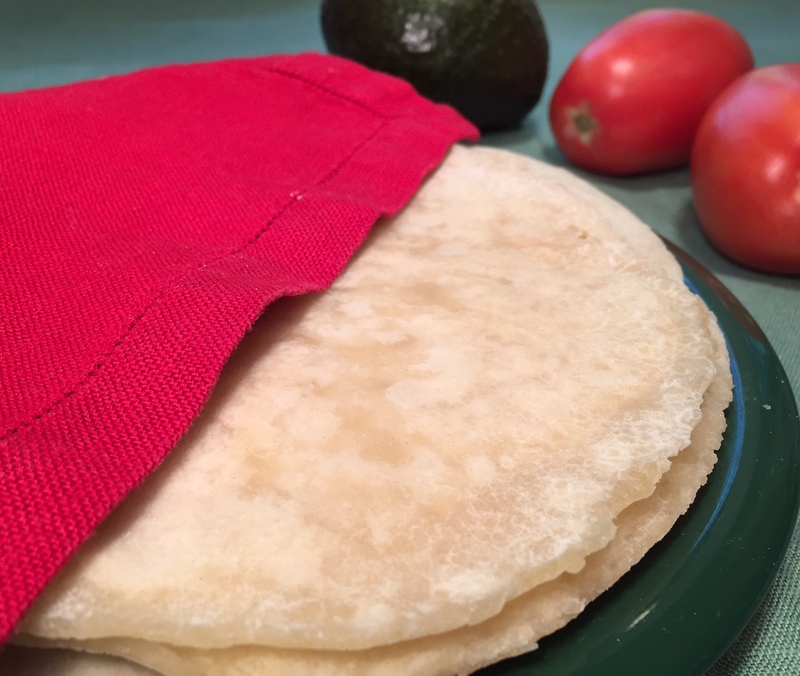 NOTE: Even if you have a tortilla press (which I do), you really need to roll them out with a rolling pin on a floured board first, then you can cook them on the press. With the heated press, they stop spreading before they’re the proper size. If you press really hard so they spread to full size before they’re cooked, they’ll shatter. I speak from experience! Squeeze some of mixture together to form a small ball. If it doesn’t hold together, turn on processor and drizzle in a tablespoon of water. Run machine another minute to knead. If you don’t have a food processor, the holidays are coming – put it on your wishlist! In the meantime, put the ingredients in a bowl and mix with a fork. Then knead for a several minutes on a floured board. Once the dough is the desired consistency, form tight balls in the amount for the size tortilla you want. I make 5 balls for 8″ tortillas. Cover in an air-tight container (I just put them in the food processor with the lid on) and let rest for at least 30 minutes. This decreases the elasticity of the dough and allows them to be rolled easier. On a floured board, flatten each ball with one hand while pushing in the sides with the other. This helps keep the edges from being too jagged. 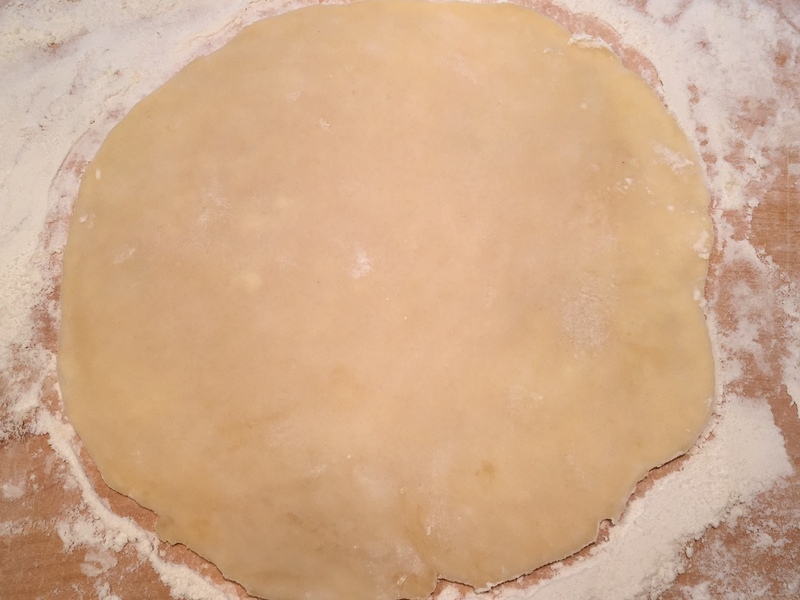 Then start rolling your dough with a rolling pin, from the center of the dough outwards, forming a circle. Heat a dry skillet (no oil or butter) over a medium flame, then place your rolled dough. It will stick initially, so don’t try to move it. After 20 seconds or so, shake the skillet and, when the tortilla scoots around, you can flip it. You don’t want to brown the tortilla (that will make it crispy), just gently cook it through. A couple browned spots on the bubbles are okay. Keep flipping and turning to cook it evenly. It should take about 1-2 minutes total. Use your eyes as a guide, not a timer. While the first one is cooking, roll out the second, etc. 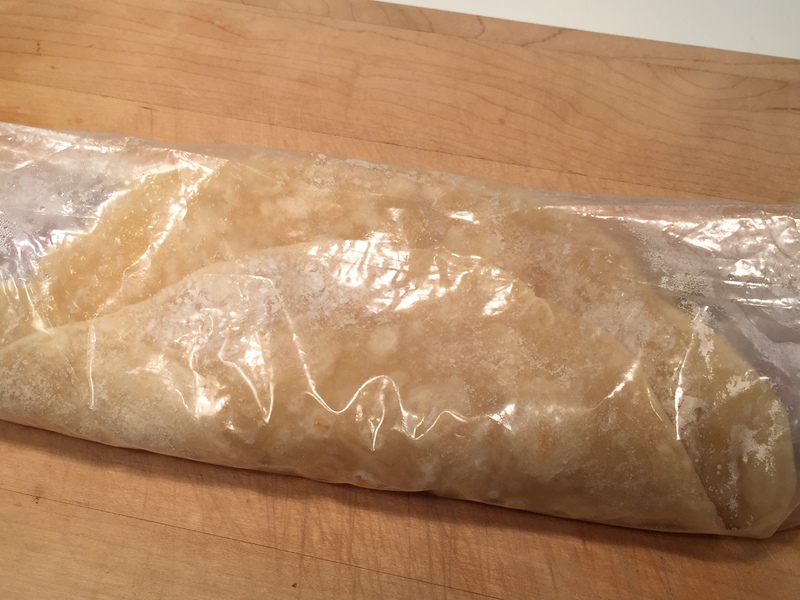 Immediately place the cooked tortilla into a plastic bag to keep it soft. If I’m making burritos, I also roll the bag to prevent the tortillas from cracking when I form the burritos. They’ll keep a couple of days in the plastic bag, but the point of making them is so you don’t have an abundance of extras. Otherwise, you’ll find yourself tearing off bits and snacking. Unfortunately, the myth that if you eat only a portion of an item the calories don’t count isn’t true. Dang!